Thank you for your interest in participating in a live Ringtail training webinar. Below is a list of upcoming webinars. 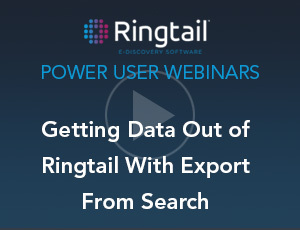 Once you have selected your preferred dates and times, please send a request to certification@ringtail.com requesting participation in those webinars. In response, you will receive webinar details and credentials to a Ringtail case that you will use to actively follow along with your trainer.